Located on the beautiful rugged Slieve League peninsula, Glencolumbkille has a history in stone going back over 5,000 years. 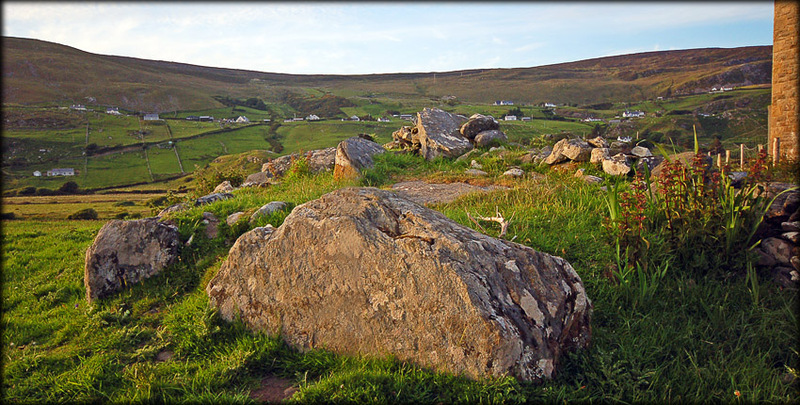 The Turas (pilgrimage/Journey) dates back to the early Christian period and takes place each year on the 9th of June. There are 15 stations on the Turas and some of these stations are pre-christian sites. Our aim is to bring you on that pilgrimage to the stations and any other sites also asscociated with the journey.The Turas begins at St Columba's Church of Ireland. 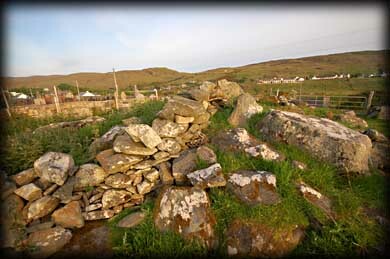 To the west of the church is a ruined Court tomb or Court Cairn built 5,000 years ago. This is station 1. When you enter the field, walk to the far end of the tomb, where there is a small structure built into the cairn. The pilgrims would kneel here to pray. Situated: Very easy to find, as you enter Glenn Cholm Cille from any direction you will see the spire of St Columba's Church. If you enter Glencolumbkille from the R263 take the first right and follow the road around to a T-Junction. Turn left here and drive/walk down to the church on your right. Station 1 is in the field immediately after the church. Discovery Map 10. G 5340 8497. Last visit June 2010.